I was introduced to running by my co-workers. In 2015, my entire office got together and ran a 5k together as part of a team building event. I’ve never really been a runner, in fact, I was “that girl” that struggled to run a mile in High School. Fast forward to 2017, Erik and I ran our first runDisney race, the Star Wars Dark Side 5k, and I’ve been hooked ever since. I moved on to complete my first Half Marathon earlier this year and eventually plan to complete a Marathon at some point in the future. Having fallen head over running shoes (not literally, that would hurt), I’ve been searching for running clothes that are functional, cute, and fit well. Unfortunately, as a plus-size runner, that is not always an easy task, especially when it comes to the bottoms. Living in South Florida, bottoms are something that I consider very carefully before buying as buying something too short can lead to a really painful run thanks to our intense heat. I have found the perfect bottoms to run in! My friends introduced me to Skirt Sports. They kept saying they’re cute and really functional. They weren’t lying! I ordered my first Skirt Sports item, the Happy Girl Skirt with shorts built in (pictured below). For a plus-size runner like myself, the shorts are the perfect length. They come to just above my knees, which means I won’t experience the awful pain of chaffing during my run. They also have tons of pockets: one pocket on each leg under the skirt and then one zipper pocket on the right near my hip (perfect for my keys and headphones). They also have a hole for wired headphones, but I will probably never use it as I use wireless headphones. They’re also super cute and match just about every running top I own. 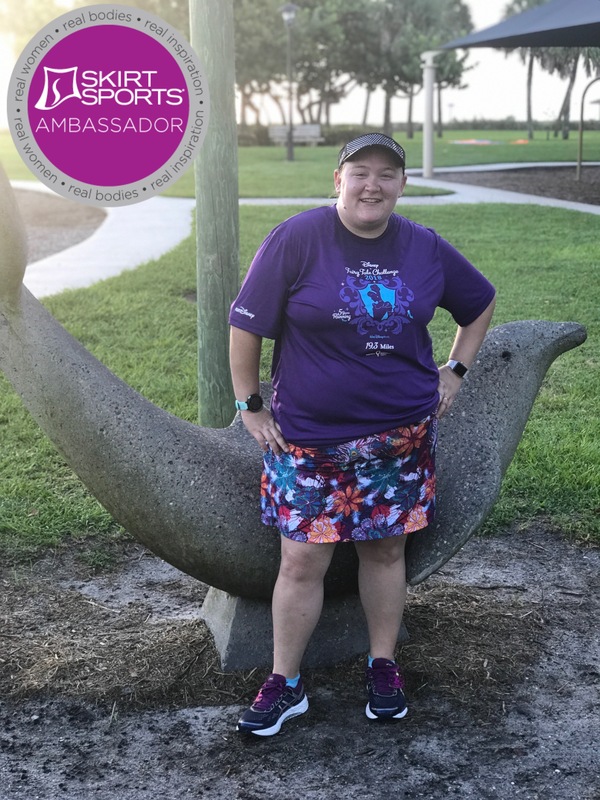 I am both thrilled and honored to announce I have been accepted into the Skirt Sports Ambassador program for 2018! If you’ve never heard of Skirt Sports (or maybe you have), they’re a company that promotes an initiative called “#REALwomenmove”. What does it mean? It means that despite what others think or say, all women can be fit regardless of their size, shape, age, or activity level. So what does “Real Women Move” mean to me? Well, for starters, I am a real woman. I don’t look like all those “picture perfect” women in magazines. In fact, I have been overweight my entire life and I struggled with it on a daily basis. This is not something that I am proud of, but I am working on changing that. I am working on being a better me: to eat better to be healthier and to exercise to be more fit. It is true that I don’t look like an athlete, but I consider myself one. Completing a Half Marathon is no easy challenge and I will take on that challenge for a second time this year in November. My goal is to inspire other women to get off the couch and get out there, whether it be running, biking, hiking, or other physical activities. If you want to try Skirt Sports for yourself, click here to visit their website. One more thing! Don’t forget to use my referral discount code ‘1004RACH’ to save 15% on your order.